Kea or Tzia is a small Greek island part of the Cyclades island complex. 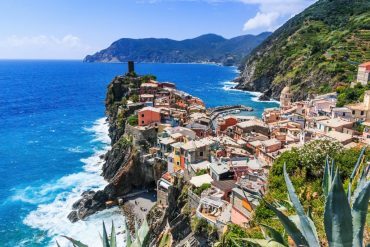 It is an island with a rich history, stunning beaches, picturesque villages and tasty food. 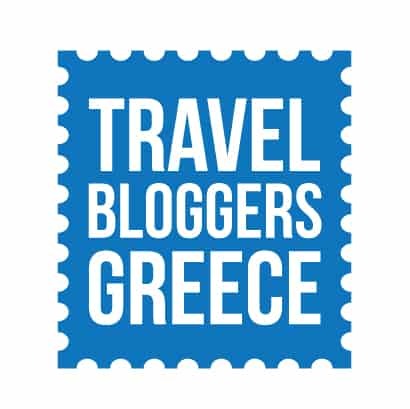 Kea makes the perfect vacation destination as it is only 1 hour away by ferry from Athens. 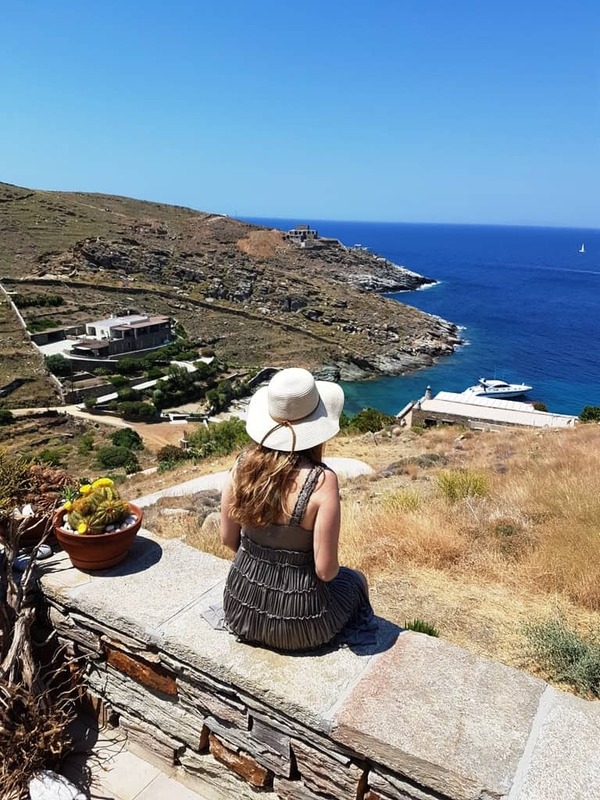 Although I have lived in Athens most of my life, I haven’t visited the island of Kea until recently, and now I can’t wait for another opportunity to visit the island. 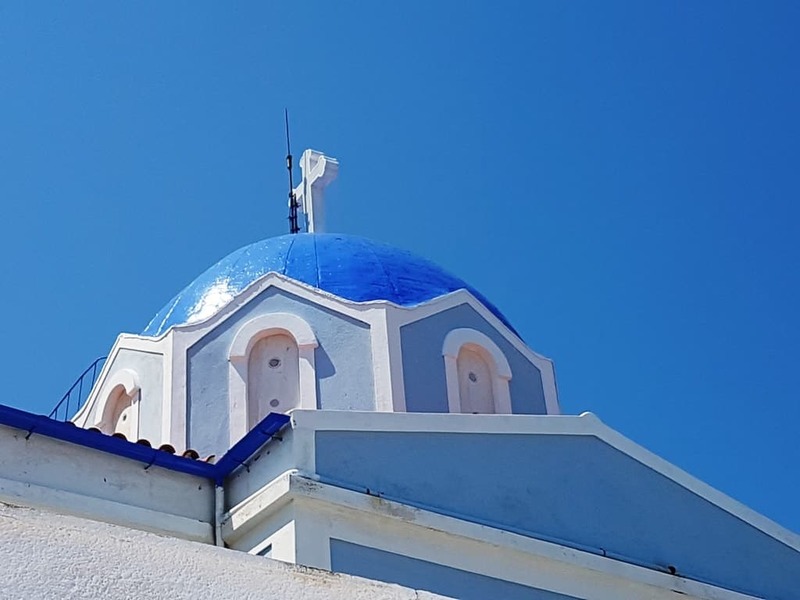 Early in June along with my husband and another couple we took the ferry from Lavrio port and in just 1 hour we arrived at the port of Kea, Korissia. 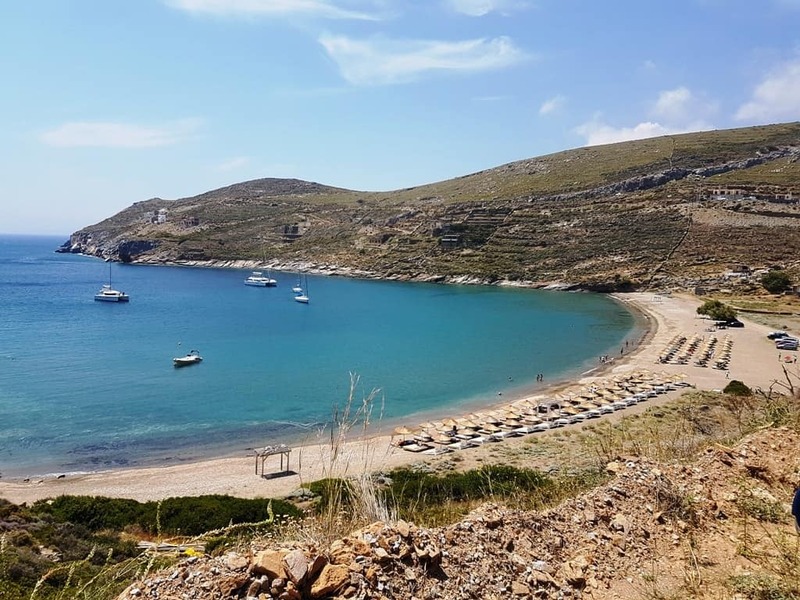 We took the road towards Pisses village, and after about 25 minutes we arrived at our destination for the next three days, Kastellakia Bay Villas. It was very easy to locate the villas as we were given detailed instructions before our arrival. 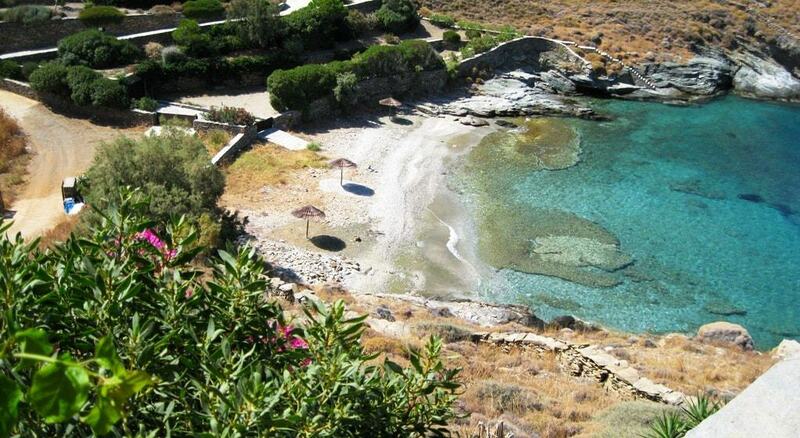 Kastellakia Bay Villas is a complex of three villas built on a secluded spot between Pisses and Koundouros villages. 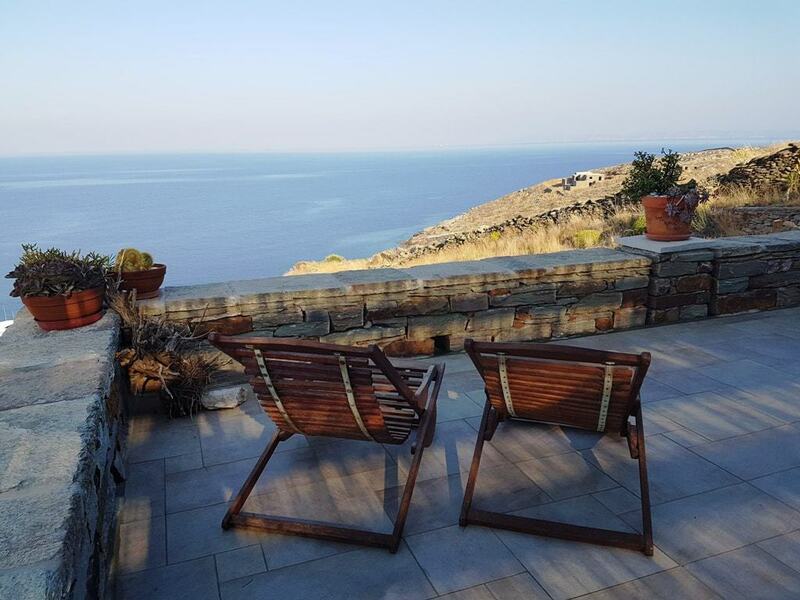 They all enjoy panoramic views of the Aegean Sea and dramatic sunsets, and they all have access to a small pebble/sand beach with crystal clear waters. As soon as we arrived at the villas, we were greeted by the owners Ruth and Michalis. They took us to our villa, Villa Aperon, and showed us around the property and gave us great recommendations on where to go and where to eat on the island. 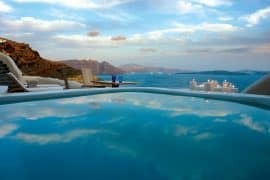 As we were a company of four plus a dog we occupied the upper level of the stone built Villa Aperon which means infinite in Greek and refers to the infinite views that you have from the property. 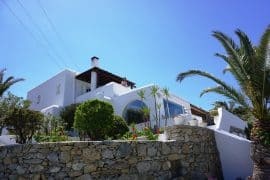 The villa is also surrounded by gardens and 270 m2 open terraces equipped with the most comfortable sun beds, sun chairs, a dining table for eight people, a small lounge, and a stone coal-fired BBQ. It also has an outdoor shower so that you don’t bring sand into the house. There is also a covered outdoor parking area. 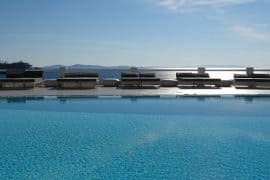 From the open terrace not only you can enjoy the breathtaking 270-degree views of the Aegean Sea but complete privacy as well. The internal spaces of the villa were equally stunning, decorated with attention to detail. 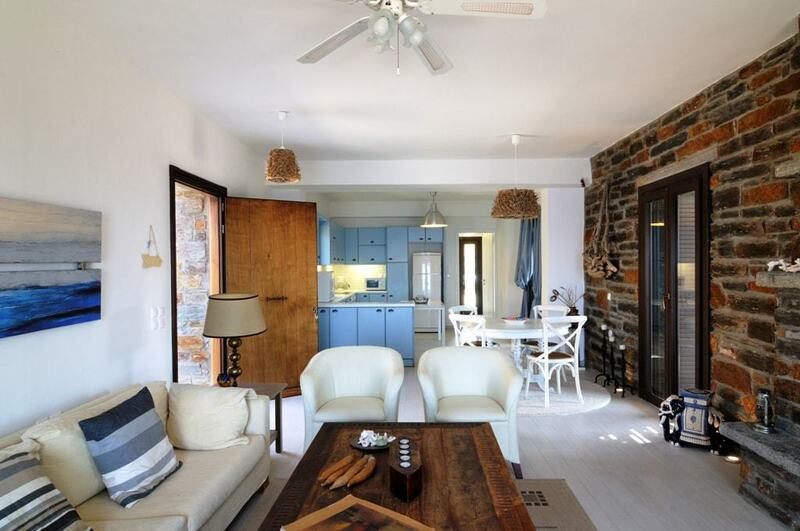 The spacious living room with the stone walls has large sea view windows, an impressive fireplace, a comfortable couch with leather chairs and a dining table. There is also a 32” Flat Screen TV, a DVD Player, a Micro HiFi, an iPod dock with speakers and a selection of DVDs and books. The living room is connected with an open-plan fully equipped kitchen. Kitchen amenities include a coffee machine, a toaster, a water kettle, a toast grill, an electric stove and oven, a microwave and a dishwasher. The villa also has two spacious bedrooms. A master bedroom with a queen bed and ensuite bathroom and a second bedroom with two single beds and a separate bathroom. Both bedrooms have ample storage space, ceiling fans and air-conditioning. Both bathrooms had showers and were tastefully decorated in earth tones. Toiletries, slippers, towels and sheets were provided by the hosts. 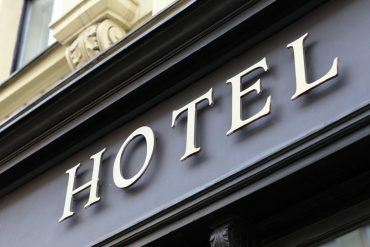 There is also internet connection at the property. 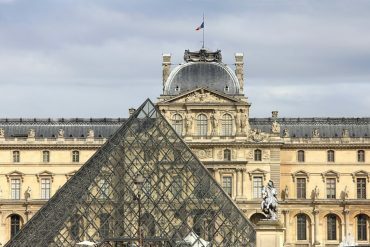 The connection is via satellite due to the secluded location, and it is limited to 1 GB download volume per week. There is an option to buy more internet if needed. Just 120 m from the villa you can find a secluded beach with reeded umbrellas to provide shade. Sun beds and beach towels are available by the hosts at an extra charge. The private beach along with the outdoor spaces of our villa were the highlight of our stay in Kea. 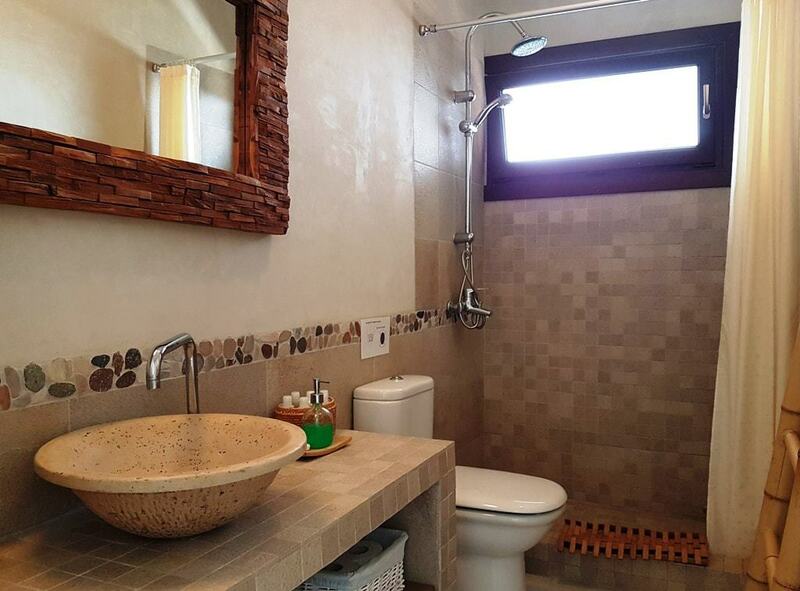 Villa Aperon also has a 35 m2 independent studio that can be rented separately. The studio can sleep up to 3 – 4 people, and it has a queen bed and a foldout sleeper – couch, a bathroom with a shower and a kitchenette. It also has an impressive outdoor sitting area with lounge chairs and a dining table. 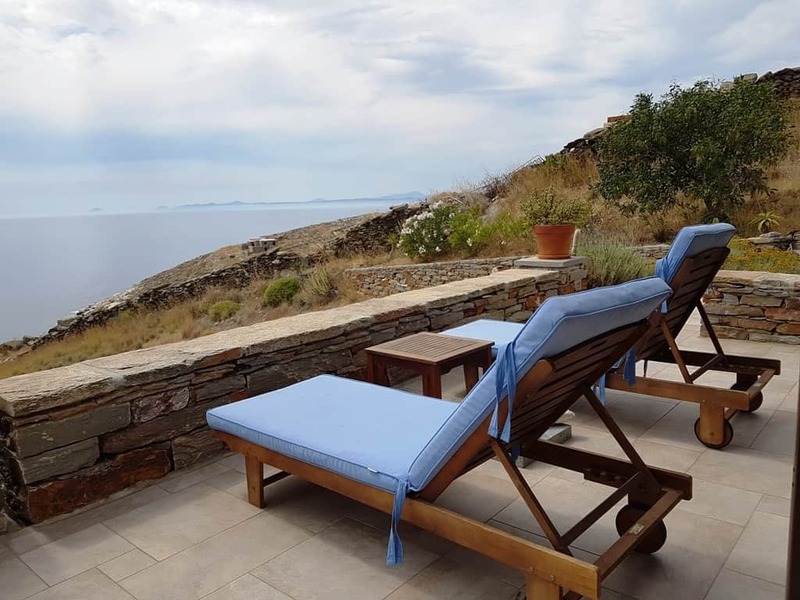 Apart from Villa Aperon, there are some other beautiful properties available for rent at Kastellakia Bay Villas, all tastefully decorated with stunning views of the sea and access to the private beach. Villa Thymari: A beachfront villa divided into two independent levels that can sleep between 4 to 9 people. 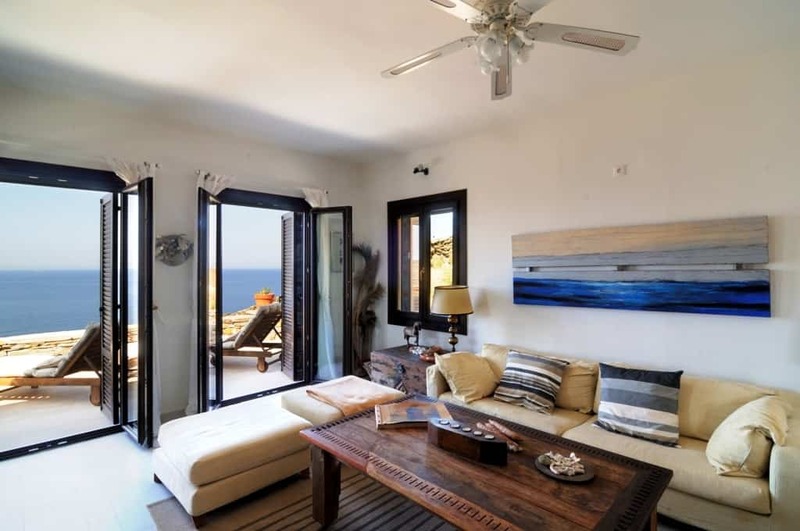 Maria Beach House: A spacious residence in front of the water that can sleep between 4 to 5 people. 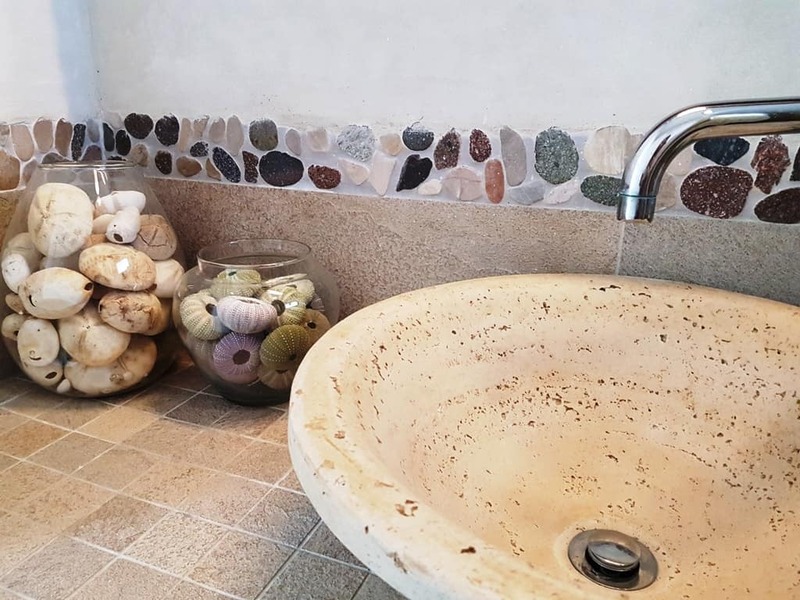 What I liked about the villa, apart from the stunning views and private beach, is that the friendly owners are there to make your vacation unique. 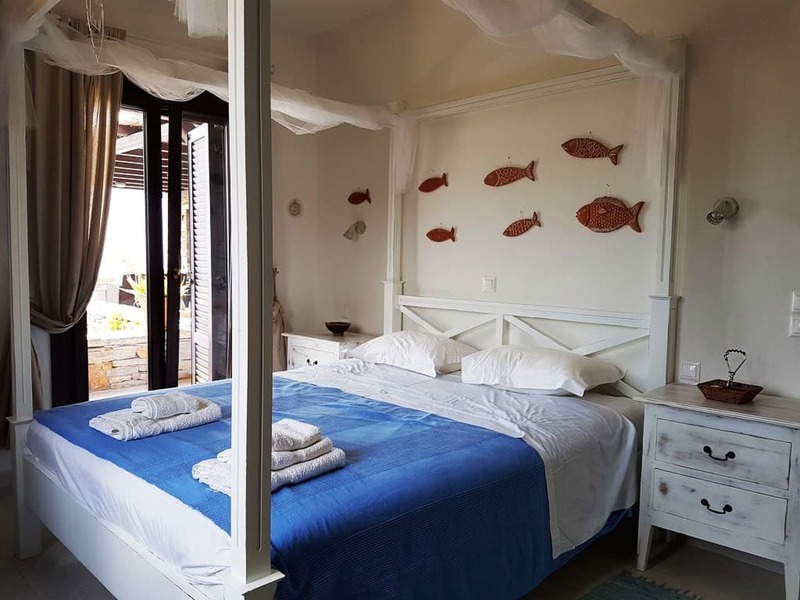 Additionally, due to the tranquillity and seclusion of the place, you are guaranteed complete privacy and to top it off the villas are dog-friendly as well. 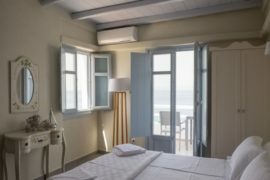 Although the villas are in a secluded location just 5 minutes by car, you will find the villages of Pisses and Koundouros with tavernas and mini markets. 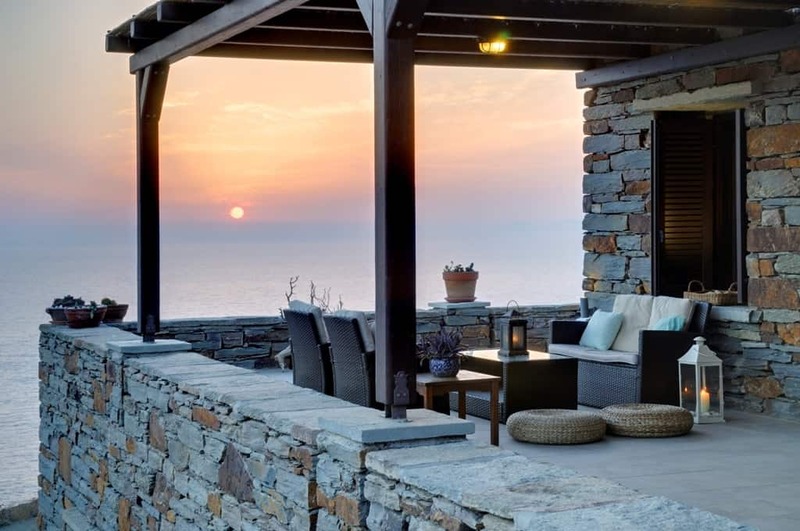 The Kastellakia Villas are ideally located to explore the island of Kea. Visit the Kastriani Monastery with fantastic views and meet the local priest. 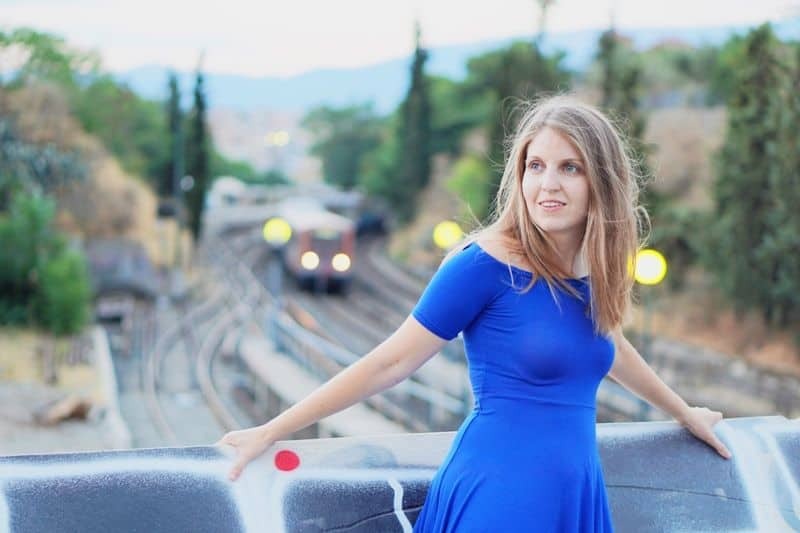 Explore the ruins of the ancient city of Karthea founded on the 12th century BC. You can get to the archaeological site through a hiking path, by renting a boat or even by donkey. Walk the cobbled alleyways of Chora or Ioulida and admire the local architecture. Discover the Lion; a huge statue carved out in granite at the 6th century BC. The Lion is the symbol of the island and can be found in Chora or Ioulida. 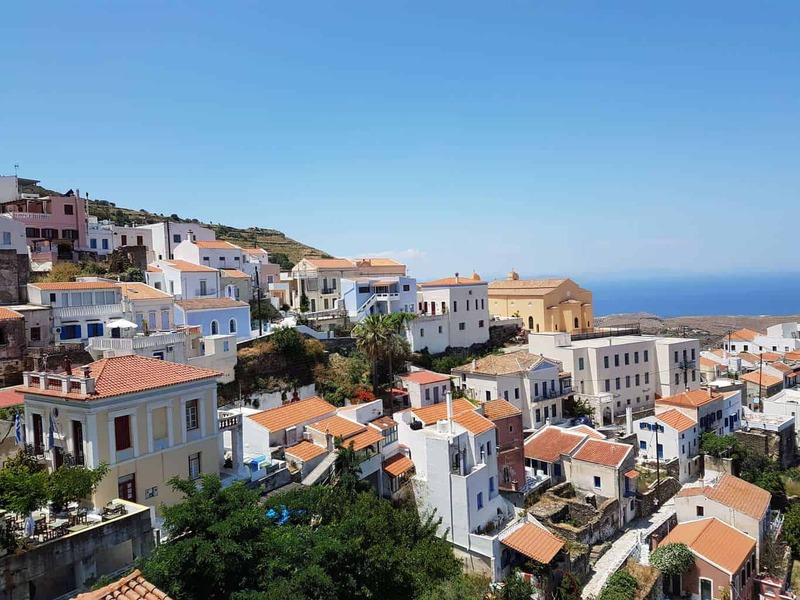 Visit the main port, Korissia where there are some excellent tavernas like Rolandos and buy beautiful souvenirs and traditional products at the shops. Enjoy the nightlife and first class restaurants of Vourkari, along with the yachts. Experience the joy of active watersports at Koundouros beach including diving lessons (PADI), waterskiing, SUP, canoes and paddle boats. 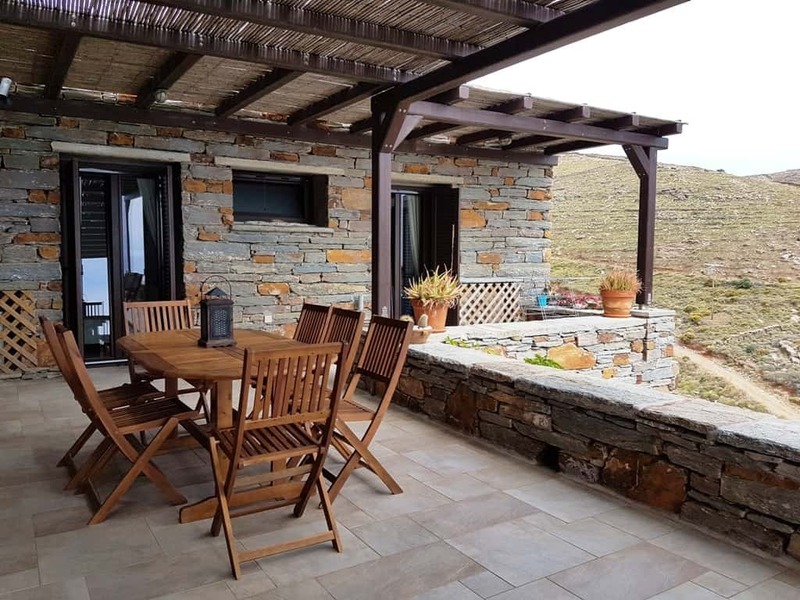 There are more things to do in Kea, and your hosts are available to provide you with many great suggestions. 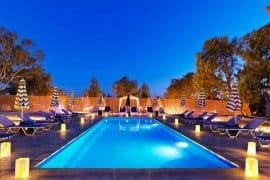 Kea is an island that caters to active sports individuals with water sports, historically minded individuals with an impressive archaeological site, or those who simply want to wind down and enjoy the privacy or your own balcony, your own beach, and superior on-site service at Kastellakia Bay Villas.